A-HOTEL.com - Luxury and cheap accommodation in Trpejca, North Macedonia. Prices and hotel, apartment booking in Trpejca and surrounding. This indicative offer was derived from the most recently booked accommodation in Trpejca and sort by the price, from cheapest Trpejca accommodation to the most expensive hotels. To select accommodation by your preferences we recommend to choose from 12 accommodation offers in Trpejca in total. By entering the dates of your overnight stay in Trpejca and using the filter tools you can sort the best possible accommodation for you. The entered dates of your stay are crucial for the most accurate offer as it derives all the online information on pricing and availability of Trpejca accommodation. Then you can book the selected Trpejca lodging (hotels, apartments etc.) immediately. Rooms and Apartaments De Niro enjoys a quiet location in Trpejca, 100 metres from Lake Ohrid, and it offers self-catering accommodations and rooms with free WiFi and access to a garden. Free parking spaces can be found opposite the building and a bus stop is 50 metres away. Villa Bube is set in Trpejca and features a terrace. All studios feature a kitchen, a flat-screen TV with cable channels, and a private bathroom. Offering barbecue facilities and a garden, as well as a terrace, Trpejca Holiday Home is located in Trpejca, 300 metres from Saint Nicholas Church. Guests have a private balcony. Bluebay Guest House is located in Ohrid, directly at the shore of Lake Ohrid, offering apartments with free Wi-Fi access and a balcony with panoramic lake views. A grocery shop and a restaurant are just 200 metres away. Situated in Trpejca, Villa Elena provides accommodation with private terraces. The property is set 500 metres from Saint Nicholas Church. Set a 5-minute walk from the Ohrid Lake, Villa Filip offers rooms with free WiFi. Free public parking is possible on site. Offering a barbecue, the beachfront Apartments Krste is set in Trpejca. Saint Nicholas Church is 500 metres from the property. Situated in Trpejca, 400 metres from Saint Nicholas Church, Villa Ristak provides a living room with a TV, a garden with a barbecue, and free WiFi. The property features mountain views. Set in Trpejca Village, 17 km from Port Ohrid, Villa Lazar offers accommodation with a terrace. The property is situated 17 km from Early Christian Basilica and 17 km from Saint Sofia. Set in Trpejca, 400 metres from Saint Nicholas Church, Apartmani Rustik Trpejca features accommodation with free WiFi and a garden with a terrace. Each accommodation unit includes a seating area with a flat-screen TV with cable channels, a kitchen with a dining area, and a private bathroom. Situated in Ohrid within 21 km of Port Ohrid, Villa Trpe offers accommodation with free WiFi, seating area and a kitchen. All units feature air conditioning and a flat-screen TV. Located in Ohrid within 21 km of Port Ohrid, Vila Kaj Laki provides accommodation with a flat-screen TV and a kitchen. Free WiFi is offered. Located in Ohrid, Guest House Gjorgi features accommodation 21 km from Port Ohrid. The apartment offers a barbecue. 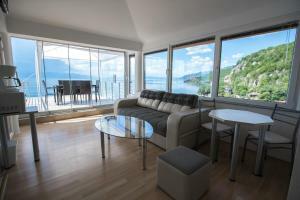 Set in Ljubaništa, Apartments Risteski offers free WiFi and lake views, 3.3 km from Ohrid Lake Springs. Featuring lake views, Villa Dragija-Ljubanista in Ljubaništa provides accommodation, a garden and a terrace. Opening to a balcony with garden views, all units are fitted with a kitchenette with a fridge.